Like I mentioned earlier, getting decent meals on the table at our house can be extremely difficult. Every night of the week we have some sort of extra-curricular activity - soccer, dance, cross country. I usually leave the house about 4pm to start taking children to activities, and we get home between 7:30 and 8pm. This doesn't leave a lot of time for me to prepare a meal. I had heard about preparing freezer meals, but I always thought that it would be far too much work for me to get organized enough to do this. 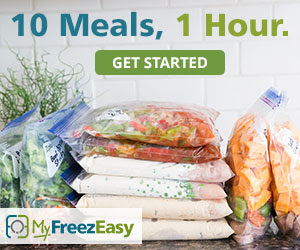 MyFreezEasy makes it so easy! They have already done the bulk of the organization; all I had to do was go shopping for the ingredients and then start preparing the meals. 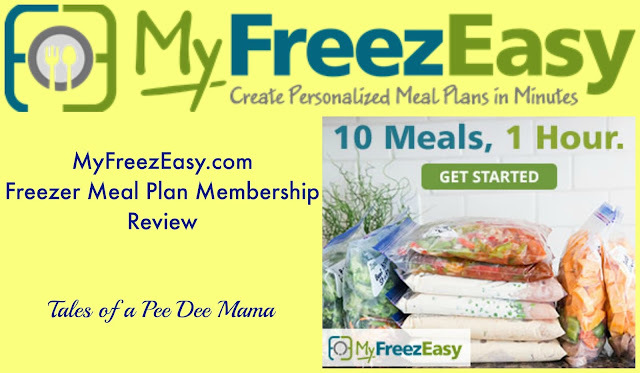 One of the things I love most about MyFreezEasy is having access to all of the meal plans. They offer 8 different meal plans: Traditional, Gluten-Free, Slow Cooker, Clean Eats, 20 Meals, All Chicken, All Ground Beef, and All Pork Chops. They also provide printable labels for labeling the meals for putting them in the freezer. Within the meal plans, there are 5 recipes with instructions for how to make 2 meals of each. You can choose to freeze both or eat one and freeze one. Each recipe has a list of ingredients for a single meal, cooking instructions for a single meal, assembly prep directions for 2 meals, and freeze and thaw instructions. Dairy-free and gluten-free modifications are also included for each recipe. In addition to the recipes, the meal plan downloads contain complete and freezer meal prep day shopping lists by recipe, complete and freezer meal prep day shopping lists by store sections, meal assembly instructions, pre-cook and chop instructions, and assembly by recipe instructions. Like I said, most of the organization is already done for me! One of my new favorite meals is the Slow Cooker Italian Chicken & Vegetables from the All Chicken meal plan. It was super easy to make one meal and put it in the crock pot while I also prepped one to put in the freezer to have another day. When we got home from cross country practice that evening, we had a hearty meal waiting for us. I have to share the best thing that has come from our Freezer Meal Plan Membership. We live in the Pee Dee region of South Carolina, and our area was hit pretty hard by Hurricane Matthew over the weekend. Our neighborhood lost power for several days. We lost a LOT of food from our refrigerator and freezer but thankfully, the 4 lbs of ground beef that I had in the freezer had only begun to partially thaw when our power was restored. I knew I could brown it and salvage it and immediately knew what I would do with it. I plan to pull up the All Ground Beef meal plan and start preparing meals for our freezer. It will be so nice to be able to put several prepped meals in the freezer to begin to replace the food we had to throw out. Are you interested in what others have to say about MyFreezEasy? Check out more reviews from the Homeschool Review Crew.